This adjustable monitor stand lets you raise your monitor to a comfortable viewing height, promoting better posture and reducing back and neck strain. Convenient slots let you prop up your phone, tablet, or other accessories. The monitor riser's cable management system keeps your desk organized. Non-skid foam pads hold the adjustable computer monitor stand firmly in place. Supports up to 22 lbs. Desktop stand frees up space below your monitor for additional storage. HEIGHT ADJUSTABLE FOR INCREASED COMFORT - This adjustable monitor stand pack lets you raise your monitors to a comfortable viewing height, promoting better posture and reducing back and neck strain. SLOTS FOR PHONE OR TABLET - Convenient slots let you prop up your phone, tablet, or other accessories. CABLE MANAGEMENT SYSTEM keeps your desk organized. 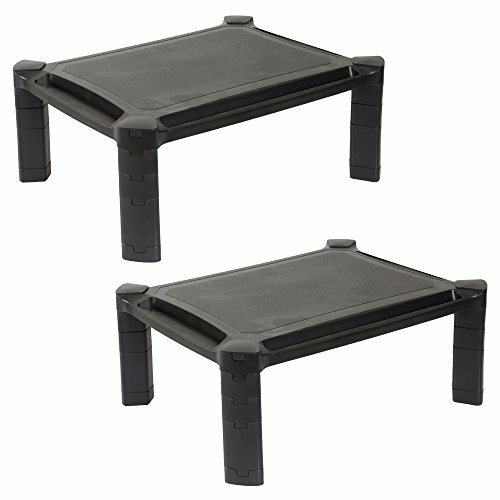 STRONG AND DURABLE - Non-skid foam pads hold the adjustable computer monitor stand firmly in place. Each stand supports up to 22 lbs. SAVES SPACE - Desktop stand frees up space below your monitor for additional storage. FREE LIFETIME WARRANTY- Ilyapa stands behind all of its monitor stands 100%. This monitor riser two pack comes with an automatic 1 year warranty. Register online for a free lifetime warranty. If you have any questions about this product by Ilyapa, contact us by completing and submitting the form below. If you are looking for a specif part number, please include it with your message.